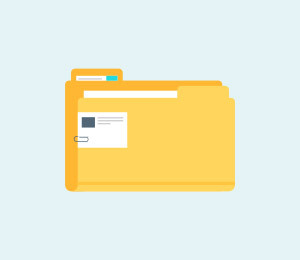 We all like to keep our important data files like photos and videos handy. To quickly access them on different devices, it is important to learn how to transfer photos from iPhone to iPad. There are already several ways to transfer photos from iPhone to iPad. 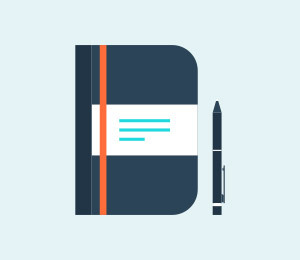 In this guide, we will make you familiar with four of these techniques. So what are you waiting for? Read on and learn how to get photos from iPhone to iPad without much trouble. dr.fone - One Click Switch is undoubtedly one of the best ways to transfer photos from iPhone to iPad. 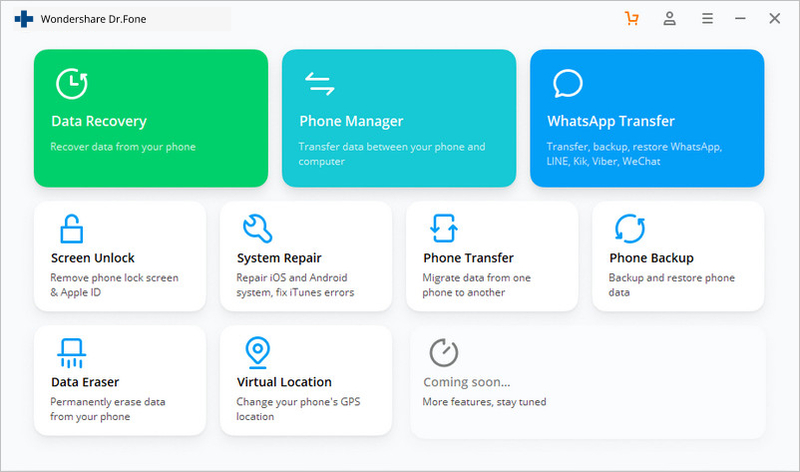 It is a complete phone management application that can be used to move your content from one device to another in an effortless manner. 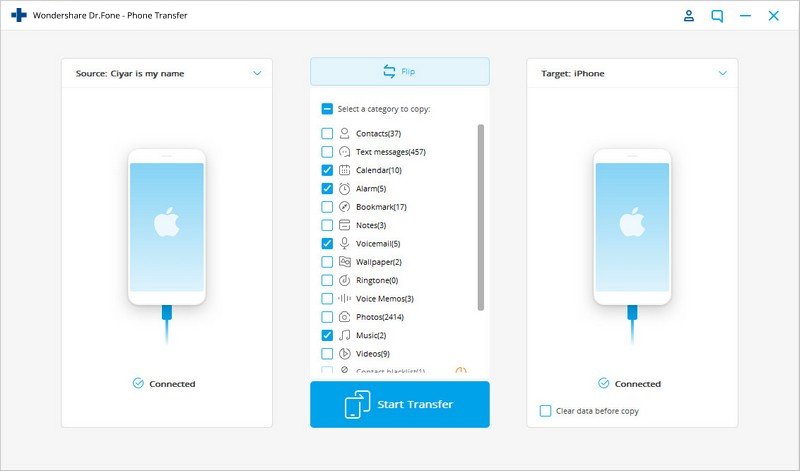 Transfer any data (not limited to photos) from any two iDevices like iPhones, iPads, and iPods. 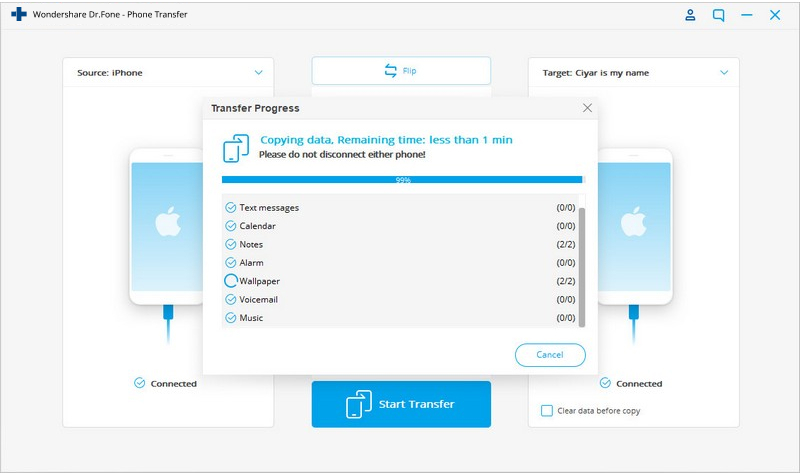 Easily transfer every type of data between iPhone X/8 (Plus)/7 (Plus)/6s/6/5s/5/4s/4 and Android, including apps, music, videos, photos, contacts, messages, apps data, call logs etc. 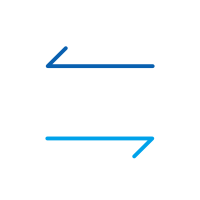 Works directly and transfer data between two cross operating system devices in real time. Supports data transfer between Apple, Samsung, HTC, LG, Sony, Google, HUAWEI, Motorola, ZTE, Nokia and more smartphones and tablets. Works well with the products from major providers like AT&T, Verizon, Sprint and T-Mobile. Supported by Windows 10 and Mac 10.13 computers. Step 1. Get dr.fone - Switch and install it on your Windows or Mac. Connect your iPhone and iPad to the system and launch the tool. Step 2. 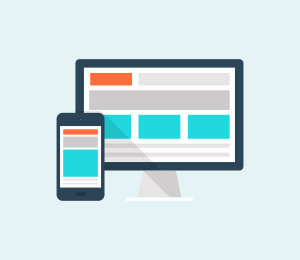 To start with, select your iPhone as the source device, and your iPad as the target device (click on the “Flip” option if you want to swap their positions). Step 3. Select the file types you want to move from iPhone to iPad. In this case, just select "Photos" and deselect all the others. Step 4. Click on the “Start Transfer” button to begin transferring photos from iPhone to iPad. Step 5. Wait for a while as the application will transfer photos from iPhone to iPad. You will be notified as soon as it is completed. 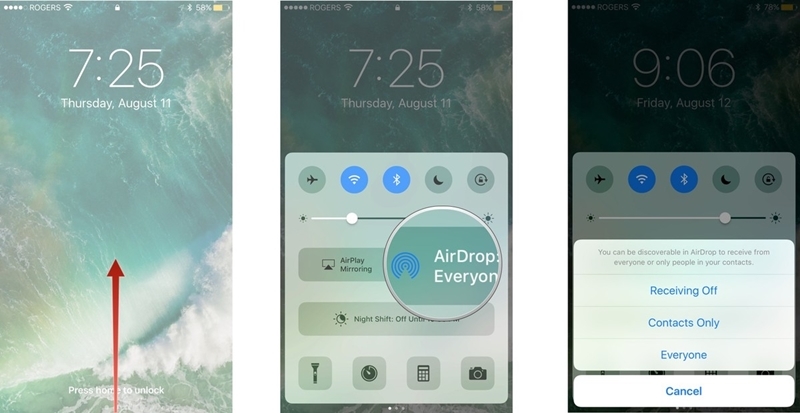 To make it easier for its users to move their content from one iOS device to another wirelessly, Apple has come up with its dedicated AirDrop feature. With it, you can share absolutely anything among Apple devices on the air. It is a fast and easy way to transfer photos from iPhone to iPad. 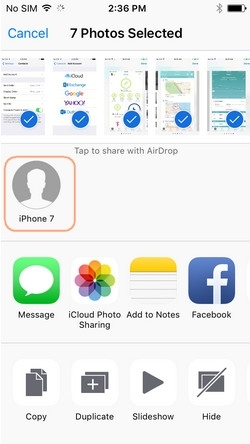 To learn how to get photos from iPhone to iPad via AirDrop, follow these steps. 1. Firstly, turn on AirDrop on both the devices. Swipe up the screen to access the Control Center. 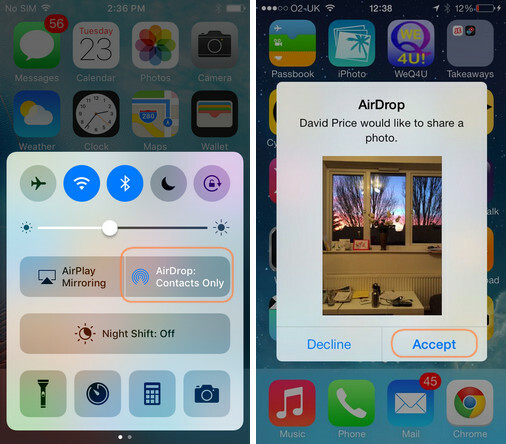 Tap on the AirDrop icon and select its accessibility option. 2. Now, go to your phone’s Camera Roll and select the pictures you want to move. Tap on the Share icon to get various options. 3. Choose the AirDrop contact from the list of provided options. 4. 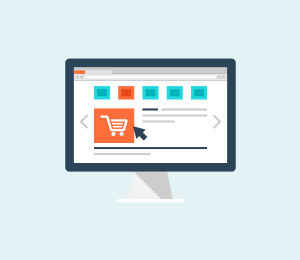 Your target device will get a pop-up regarding the incoming data. 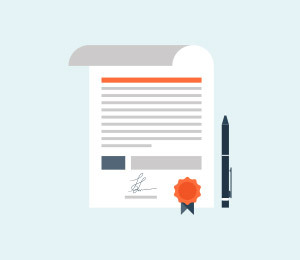 Simply accept it to complete the transfer process. After following these steps, you would be able to learn how to transfer photos from iPhone to iPad effortlessly. 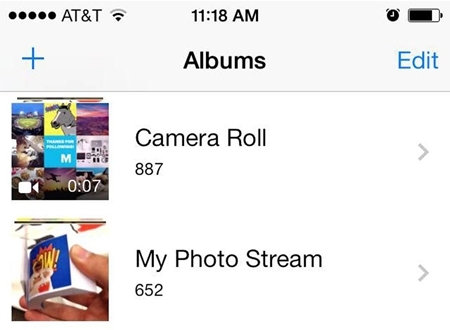 Photo Stream is another popular alternative to access your recent photos on different devices. Apple came up with this tool for the same purpose, as it supports a maximum of 1000 pictures (or uploads from the last 30 days). Unlike iCloud Photo Library, Photo Stream doesn’t consume your iCloud storage. Additionally, the quality of the images is optimized according to the device. Therefore, it is not an ideal way to take a backup of your data. Though, if you simply want to access your photos on various iOS devices, then this would be a perfect solution. To learn how to get photos from iPhone to iPad instantly, start by unlocking your iPhone and visiting its Settings > iCloud > Photos. Turn on the option of My Photo Stream on it. Repeat the same process for your iPad and wait for a while for your recent photos to be synced. Make sure that you are using the same iCloud credentials. 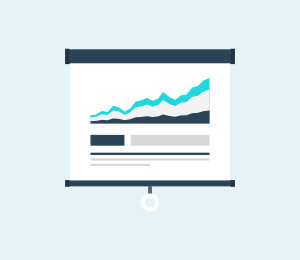 Afterward, you would be able to access various uploads from the last 30 days on multiple devices seamlessly. Simply go to your iPad's Photo Library and open the "My Photo Stream" album to view these pictures. If none of the above-mentioned solutions would work, then simply take the assistance of iMessage to transfer photos from iPhone to iPad manually. The technique might work for a handful of pictures, but it would be pretty time-consuming if you wish to send multiple images. Also, it will consume the network data on your device as well. To learn how to transfer photos from iPhone to iPad via iMessage, follow these steps. 1. 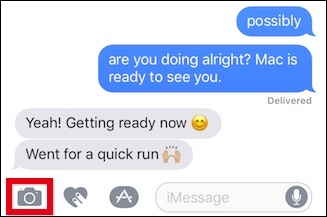 Launch the Messages app on your phone and open the message thread of your choice. 2. 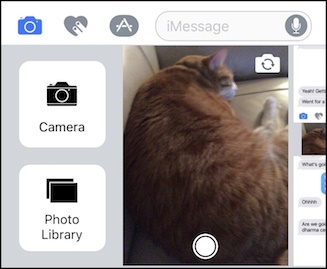 Tap on the camera icon (thumbnail of the photo library) nearby the stickers and App store icon. 3. From here, you can choose to click a picture from the camera or attach an existing image from your phone’s Photo Library. Attach the image from photo library and send it to the recipient. You can also send it to yourself or save it as a draft too. If you are not using iMessage, then you can also take the assistance of any other messaging app as well (like WeChat, WhatsApp, Line, Skype, etc.) to send photos to any other device. Go ahead and follow your preferred option to transfer photos from iPhone to iPad without any trouble. Now when you know how to transfer photos from iPhone to iPad, you can easily access your favorite pictures on the device of your choice. If you are already familiar with an easy way to move pictures across multiple devices, feel free to share it with our readers in the comments below. Get a new phone but don't want to give up stuff on your old phone? This guide would show you top phone transfer apps to help you transfer phone data. Want to transfer data from Android to iPhone X or iPhone 8/8 Plus? Here are some easy and free ways to transfer data from from Android to iPhone X or iPhone 8/8 Plus. Know all you need to know about Samsung Kies 2 and how to Samsung Kies 2.0 download for free! Learn how to perform Android to Android data transfer in this informative guide. 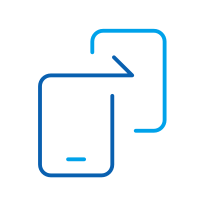 We have provided three ways to transfer data from Android to Android. 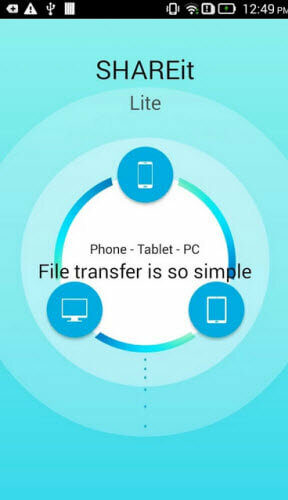 How to Transfer Contacts from Android to Android Devices? 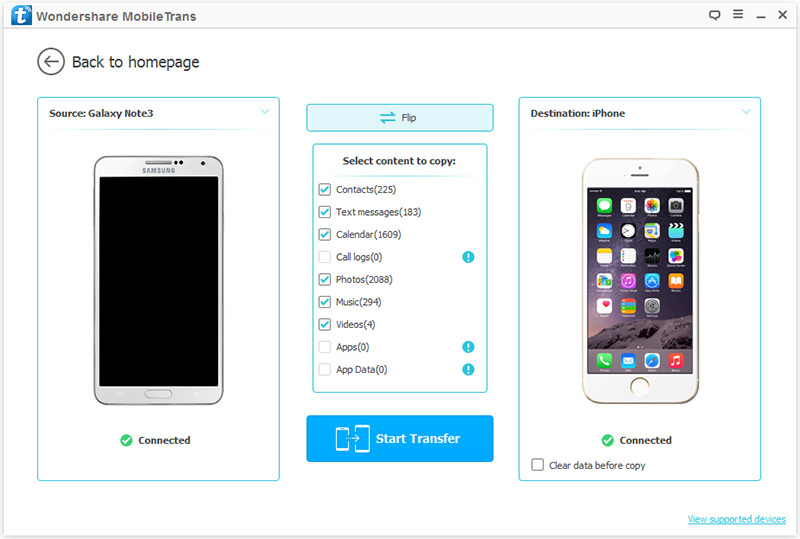 In this article, we’ll learn how to transfer contacts from Android to Android and understand different procedures of transfer contacts from Android to Android. Here are 3 ways to transfer content from old Android to Samsung Galaxy S7. However, the easiest way out is with Wondershare Mobiletrans. The following part guides you through three different methods on how to transfer data from old iPad to iPad Pro, iPad Air and iPad Mini.